One of the benefits of working with Game Maker Studio, compared to older versions, is that I can build updates much more easily. This means I can do bug fixes and release updates more often than before. If you had trouble getting the demo to run in Windows XP, you should give this update a try. As always, feel free to report any bugs or make any suggestions here or at the forums. Gracias doc por haber colocado la opción de elección de música, así podremos decidir si queremos las anteriores o escuchar las actuales. Pido disculpas por haber dicho que no leía acotaciones. Siempre genial tu, te pasate Gracias!!!!! buen juego para los nostalgicos de Metroid. there seems to be a glitch right in the area where youll soon meet the first gamma (i guess its breeding grounds 2) where you get a new logbook entry but when you go into the logbook there is nothing new there. is it just the system reminding you of the first breeding grounds entry? or was something else supposed to actually show up? Suggestion: As you're now using GameMaker Studio, AM2R is no longer natively portable (that is, being able to run it purely from the likes of a USB flash drive). Therefore, would it be possible to have a PortableApps versino? Whoah! Well done. I love metroid games. And your ones pretend on the "official" metroid game. I run the game on Linux. And I have some glitches with fullscreen. Sometimes switching between map changes windowed/fullscreen mode. Also I have two displays and game go to the fullscreen and FIT BOTH dysplays. But usually game go to the fullscreen on main display. Well this is fantastic. I'm not sure how frequent you are planning on having the updates, but it's always good if they're easier to make. Thank you as always for your great work. It is because it is attempting to load the save files from the folder, (it will take them from Appdata if it doesn't find them there). Version 1.33 just ignored them, so you didn't get the crash. Dude, this project is so incredibly awesome! You should definitely continue on with this! un detalle para el gamma evolucionado Ponerle como dientes o boca y un caparazon podrido (blanco) como el que se ve en el review 4 de tu juego que aparece el zeta de un caparazon blanco. que tengas una buen dia. Doc, ha pasado mucho desde que di mi LAAARGA sugerencia xD Primero que nada, hasta la versión 1.32 tuve problemas de compatibilidad en los cuales el juego, después de unos segundos se volvía lento e intermitente. El demo 1.33 es simplemente PERFECTO pero se presentó un problema en la versión 1.34, ya que al iniciar, automáticamente reduce la pantalla a tamaño estrecho y en pantalla completa (obligándome a configurar la pantalla desde el principio). Ahora, en los últimos momentos del Demo, los pasillos están algo vacíos, aunque espero que sólo sea cosa de esperar el juego completo. Por lo demás, está perfecto, en especial ver que varias de mis sugerencias surgieron (como ver cada Alpha Metroid más cabrón que el anterior x'D) Y pues eso, ya desde aquí, espero la corrección de ese pequeño error del demo, y de ahí en adelante, el juego completo (Y) Hasta la próxima. Can you make this game in a 16:9 aspect ratio? I really hate the old 4:3 aspect ratio which doesn't cover the entire screen. Aquí otra vez. Doc, creo que la batalla contra el Torizo es excesivamente desbalanceada en Difícil. Ya llevo 25 intentos seguidos de matarlo y no consigo pasar con más de 99 de vida a la segunda parte de la batalla. Las oportunidades de conseguir algo de salud y munición cuando lanza los proyectiles de su boca son casi nulas, por lo que se podría decir es CASI imposible pasarlo, incluso para los jugadores más experimentados. No digo que no sea posible pasar, pero en realidad, hay que ajustar un poco la brutalidad del jefe, que ya en las dificultades fácil y normal es bastante cabrón (por menos decir). Me despido y hasta la próxima. ._. +Rockman Trigger Más que apariencia (aunque les veo con algunos cambios como cola, como los Alfa les crecen patas) lo que me interesa ver es el comportamiento del Gamma avanzado. No cabe duda que sobrevivirá más supermisiles, pero podría alcanzar más distancia con la electricidad o incluso agarrase al suelo con patas mas fuertes para cubrirse (e intentar caminar). De hecho, creo que un Gamma ligeramente avanzado para la última area de la demo le daría un poco más de vida. Hey doc realmente te luciste con este remake eso también habla de tu busqueda de altos estandares, originalidad y calidad, entiendo que ahora que puedes sacar actualizaciones mas a menudo el proyecto lo podrias finalizar en menos tiempo sin temor a equivocarme, espero con ansias el nuevo demo del area 4 y mas sorpresas solo tomate tu tiempo. Looking great man! Can't wait for the next major content update! I had already fully updated my drivers and system prior to this, and update 1.32 opened with no problems. I looked forward greatly to the new update but i was dissapointed when it wouldn't work.. I hope you can perhaps fix this, and thank you for your time and hard work! I just downloaded the new version of AM2R and opened it and I was almost fooled into thinking that I still had 1.33 because it says it on the window, but when you look at the title screen it says 1.34. I think it needs a quick fix. I just wanted to say that you are awesome. I'm also an enormous fan of the Metroid series, and I'm saddened that the fandom seems to have stagnated a bit. There's not a lot for the fandom to do or talk about really. All the fan sites seemingly never get traffic or get updated anymore, which leads to crap like Metroid: Fan Mission going into archive mode. Harmony Of A Hunter was awesome, but there hasn't been any Metroid related things going on since then. Whenever conversations about Metroid do happen, they always seem to be about people defending other m, or hating it, and making dumb "baby" jokes. The point is, you are doing amazing work on this project, and it's going to be great to finally play a complete Metroid game again (other m doesn't count obviously). I could never have the patience and persistence that you have to keep making this game. Keep it up man. I just wanted to say that this latest demo was seriously impressive. I have been lurking and watching this game for a long time, trying to wait for the full release before actually playing it, to get the whole experience at once. But this latest demo, I finally broke down and gave it a try and man was I not disappointed. It seemed the more I played, the more impressed I got. First reaching the ruins and hearing that classic ruins theme in far better quality... it was a sweet moment. The rest of soundtrack also impressed me, some songs more than others, but I loved all the Prime references, such as in the Torizo battle. The music Having differen more ambient tversions of the songs was a very nice touch as well! I got chills when area 2's remix of Super Metroid's brinstar theme began, it was most appropriate. I also loved how each area has its own style and purpose, they're not just random ruins anymore. I am looking forward to your take on the final areas. Even within each area, those extras like the morph ball water launchers, the mining machine, and controlling another robot to get the Super Missles all show this is a true labor of love. The lighting in area 3 truly made it atmospheric to explore. The gameplay itself felt very solid, I was able to tweak the controls just how I liked them. I didn't find any noticable bugs in my playthrough, so kudos to you on that. The speed booster is fun to play with, though I hope to find even more areas to truly make use of it in later releases. I did find the pause menus a little unintuitive to navigate at first, but they certainly did the job. Seeing the logbook get gradually filled as you go with updates was a nice touch, seeing the descriptions of each area. Seeing what happened to the GF research team, now I want to find out about the rescue team too! I'm also curious if there might be any references to the X parasites planned.. I know they're meant to be a new discovery when Samus first encounters them in fusion, but even a logbook entry referencing the Metroids' original creation, the fall of the Chozo civilization, and for what purpose they were made for could be interesting to see! Working on a Metroid style game myself, I know how much effort and time goes into making something like this. (Search youtube for Mannux is you're curious). My only hope is that you and your team can keep it going to the finish line. You should be proud! Sobre el equipo de rescate que menciona Hatchet deberias poner a solo 1 vivo pero agonizante asi como la mano alzada y cuando samus se acerca al tipo se aparece un metroid y lo apuñala por detras..
Que tengas un buen dia doc :). I had problems running earlier versions of the demo on Windows Vista, but this runs perfectly. This is already one of my favorite Metroid games. So much fun! This is a fantastic project, and I would love to see a remake of other games using this engine in the future! My only issue with this release is that missiles often don't fire when diagonal aiming, same with beams (although if you hold down the fire button, it'll do a pretty cool rapid-fire with the beam sometimes). Hey, I'm one of the people who have been kinda keeping up with this project. I've tried the demo and I am impressed. The remake is great and the controls are seamless and responsive. I am playing it using a SNES controller and mapped the buttons to match super metroid's control scheme. Lo siento doc pero ya me estoy impacientando ,tanto que hice speedruns otra vez en todas las ranuras XD si puedes hacer un nuevo update del blog (si es que tienes tiempo libre ) Por favor lo harias? Hey doc!, u know? ur game is like 91% compatible with windows XP!!! sorry for saying that it wasn't compatible on XP, for those ppl that says that gets error to open it just install "DirectX 9" it will solve all problems with the game and it will run nice :D.
Everything thus far has been fantastic, though most of the spike-wall boss's projectiles and the Arachnus' shockwaves mystify me as to how you're supposed to dodge them. I just really really moved this game. I didn't know that the amazing fan-made game exist like this. Thanks for giving wonderful hours. Good luck! I was very excited!!! Having gotten a bit further into the game, I'm glad to see the wall section that confused me seems to be strictly an early phenomenon, and I really like the way Alphas progress, instead of all being identical clones. I especially like how one has longer legs than the others. I have, however, run into a bug: using the Windows key (On a Windows 8 machine) and then going back in leads to the screen providing mostly black display with just a little bit of stuff visible, but nothing to do with the game. The game is still running, I can hear the sounds I would expect when I jump and whatnot, but I can't see anything and haven't been able to get back to seeing stuff. I was actually not a fan of the Metroid fight music initially -it's simple, is a short loop, and is weirdly silly- but having encountered my first Gamma and noticed the music was a bit different I'm growing more fond of it, and actually looking forward to later variations. Absolutely fantastic. The bosses are challenging and intense, and the spritework is incredible. This is the closes thing to a nintendo-made 2D metroid we're ever going to get and the work shows. Controls are fantastic. I almost wish save points didn't reset your missles and super missles; I found it relatively easy to go back to a save and reset my missles if I ran out between battles. Kind of removes a little bit of the intensity of having to scavenge for extra ammo and conserve. The torizo battle was fantastic. I wish it had more sprites for when it switched directions while flying. It seemed a little odd to see such a well programmed and animated creature with only a few sprites animated when it changed directions. I'm also catching a weird little bug where every 10 minutes or so, there is some weird frame slowdown where the game spazzes for a few frames then runs perfectly fine again after pausing/unpausing or leaving and re-entering a room. Not sure if it could just be my hardware, or just a V-Sync bug or something. I'm running Win8. This was so incredibly addictive and when the demo ended I was left still salivating for more. I can NOT wait to see the next areas. DoctorM64, you are a god for putting this all together. I just watched the demo on YouTube and I'm pretty impressed. I didn't like the jumping sound it got quite annoying in the beginning, but later in the demo it blends in the music so its not terrible. I will stream this game once it is completed and the game is fully functional. 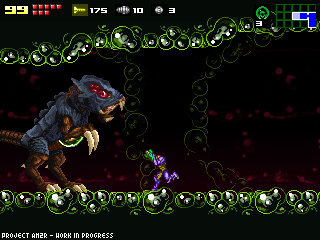 I was very impressed with the chozo fight and agree with previous posts about the metroid: zero missions copy and low sprite detail when chozo flies to be true, a TouchUp on these things will improve an already stunning project. My stream is www.twitch.tv/rageypoo and if you want me to stream updates I can do that, the fans will love to see it live. Finally! A Metroid game with proper space jumping! Oh yeah, everything else is pretty fantastic, too. I have to agree with an earlier post on how some of the walls look like background images, and it's a little confusing at first. Can't think of any other criticisms at the moment. But looking forward to further updates and especially the finished product. I'm loving it so far.